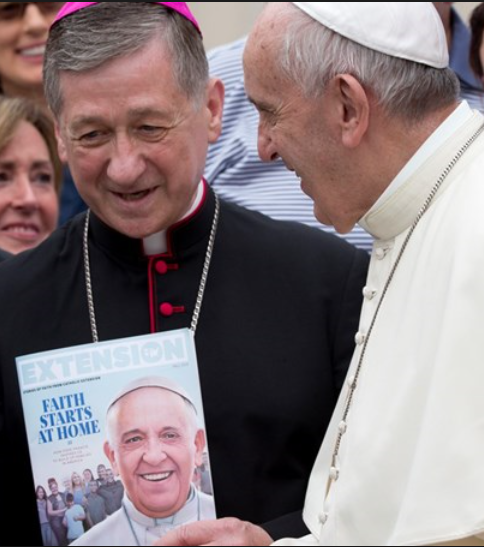 In the immediate wake of Archbishop Carlo Maria Vigano's allegations concerning Pope Francis' protection and promotion of sexual predators in the clergy, Archbishop Blase Cupich told Chicago's WMAQ-TV that "the Pope has a bigger agenda. He's got to get on with other things: talking about the environment, protecting migrants and carrying on the work of the Church. We're not going to go down a rabbit hole on this." The next day, Cupich repeated that theme while addressing seminarians at Mundelein Seminary in the Chicago suburb of the same name: "We have a bigger agenda than to be distracted by all of this," Cupich told the seminarians, one of whom spoke anonymously to the Chicago Sun-Times about the archbishop's address. The Sun-Times published the story Sept. 10 after receiving confirmation from other sources, including several seminarians. Cupich's comments demonstrate more than institutional arrogance and contempt for the victims. They provide excellent evidence that the hierarchy -- especially the Vatican -- has deteriorated into a political lobbying group, first and foremost. Even better evidence is Cardinal Pietro Parolin's attendance at the Bilderberg Meeting in Turin in June, a year and a half after he addressed the World Economic Forum in Davos, Switzerland. The Bilderberg Meeting -- which features political, economic, academic and media leaders from around the world -- is designed to stimulate "informal discussions about megatrends and major issues facing the world," stated the group's website. Parolin, the Vatican's secretary of state, was the first high-ranking official from the Holy See to be invited in the organization's 64-year history. An anonymous Vatican official told National Catholic Register's Edward Pentin that the meeting's planners emphatically wanted Parolin's attendance. "The cardinal decided to take part after the Italian organizers very insistently invited him to the meeting (in December 2017)," the official told Pentin. "He thought about it for a long time and, after consulting the necessary people, he decided to go." Why did Parolin accept the invitation to attend a series of meetings addressing such topics as economic inequality, political populism in Europe, free trade and the United States' international role? "Simply to convey Catholic social teaching" while communicating "the voice of the Church to people who wouldn’t otherwise hear it," the anonymous Vatican official told Pentin. Throughout the centuries, Popes issued encyclicals on political and economic issues, and bishops used their influence to affect political outcomes. But the late Malachi Martin, a Catholic author and scholar who knew the Vatican well, asserted that prelates now view politics as their fundamental calling -- even superseding spiritual responsibilities. "There have always been temptations in the Church and for churchmen for gold, for sensuality, for pride and ambition," Martin told Canadian interviewer Bernard Janzen. "But this is the first time that a new assault has been launched. "The assault is very simple: Just be like the rest of men. Adore a general God. Be good. Be compassionate men. Be humanitarian. Join man in building man's earthly habitation in this world." Martin was alluding to the secular vision of a humanist, materialist utopia fostering a universal religion -- a vision that modern Catholicism embraces. Before his death in 1999, Martin was writing a book exploring and exposing that embrace. The book likely would have been his magnum opus. The title? Primacy: How the Institutional Roman Catholic Church Became a Creature of the New World Order. "The ultimate goal is a full-bodied humanism. And does this not mean the fulfillment of the whole man and of every man? ... True humanism points the way toward God and acknowledges the task to which we are called, the task which offers us the real meaning of human life. Man is not the ultimate measure of man. Man becomes truly man only by passing beyond himself." Other documents range from "Gaudium et spes," which concerned political and economic conditions in general, to Pope Benedict XVI's "Caritas in Veritate," which called for creating an international authority that would devise a "directed" economy to "open up the unprecedented possibility of large-scale redistribution of wealth on a world-wide scale." The increasingly materialist emphasis also found expression in papal foreign policy, as Martin told interviewer William F. Buckley following the 1978 conclave that elected Venice Patriarch Albino Luciani as Pope John Paul I. On Buckley's PBS program "Firing Line," Martin described why Paul VI and his secretary of state, Cardinal Jean Villot, favored Communist and socialist governments. "Paul was doing this deliberately from a rather a cold-blooded, rational policy," Martin said. "He was persuaded from 1967 that, come what may, we couldn't stop the advent of Communist parties, legally or by violence, both in most of the main countries of Western Europe and in every country from Mexico down to the tip of Latin America. Hence, his idea was, 'Let's survive by making friends.' He had a left-wing touch." That touch ventured into appeasement. "In Hungary, he consented to conditions for the Church there, which are intolerable, really," Martin told Buckley. "Every bishop has a KGB man sitting at his chancery. You give your card and he computerizes that with Moscow. For 7 1/2 million Catholics, Paul agreed to five seminarians a year, one boys' school and one girls' school. Limitations beyond belief. With no right-wing government would Paul have any such truck." Western archbishops who sympathized with socialism and those in Communist countries reinforced Paul's approach. "You find them all with this mentality: 'Look, we're not atheists. We're not Communists,' " Martin said to Buckley. " 'But we can live with their politics and we can live with their economics, and we must because two-thirds of humanity get to bed hungry and get up miserable.' "
Geopolitical concerns also motivated the coalition that supported Luciani in the conclave. Led by Polish Primate Stefan Wyszynski, that coalition included the archbishops of Krakow and Munich/Freisling -- Cardinals Karol Wojtyla and Joseph Ratzinger -- respectively. "What made Luciani was the outlook of this new coalition," Martin told Buckley. "They wanted no truck with Communism. They say, 'What Wyszynski did in Poland, we can do all over the world.' "
What did Wyszynski do? He guided the Church in Poland toward a fundamentally ethical focus and away from political alliances -- especially since war left Polish Catholicism with nothing of material value. "What Wyszynski did in Poland is very interesting," Martin told Buckley. "Wyszynski told me (in 1976) that they made the resolution that for the first time in about 700 years, the Polish church wouldn't politic." Martin cited Wyszynski's actions during a series of nationwide strikes in 1976. Workers protested massive increases in food prices, ranging from 30 percent for vegetables to 110 percent for high-quality meat and 150 percent for rice. Edward Gierek asked Wyszynski to convince workers to return to their jobs because the nation needed food and clothing. The primate agreed. "Then he got in the pulpit the following Sunday and tongue-lashed Gierek and his Communist government for their atheism and their infringement of the rights of man," Martin told Buckley. "He then wrote a letter to the workers and said two things. You have the right to strike but you also have the obligation to think of food and clothing for your fellow countrymen. "He never exhorted them to obey the government. He never played politics. (The Polish church's) rule was, they would never play politics. They would only deal with the ethical and moral and religious content of any situation." Yet when Wojtyla became Pope John Paul II after his immediate predecessor's 33-day tenure, politics once again became the prime directive. "John Paul's concentration and febrile activity were directed almost exclusively to the geopolitical issue in human affairs," Martin wrote in his 1990 book, The Keys of This Blood: Pope John Paul II Versus Russia and the West for Control of the New World Order. "He did not undertake a serious and professional attempt to restore the former unity or to extirpate from the Church the known sources of its inner decadence. At one early moment, he even asserted that his Church structure could not be reformed." The late Pope's focus on geopolitics enabled him to act like a Winston Churchill against Communism. As a result, Communist regimes in Eastern Europe collapsed and the Soviet Union, which imposed those regimes, disintegrated. In the aftermath, John Paul relied on ecumenism to help forge an ideological alternative in Europe. "The Church is aware that it can offer a sort of new civil religion to the United States of Europe," wrote Enzo Pace, sociology professor at the University of Padua. "The search for moral unity … represents for the Church a reconfirmation of its central role in history and, at the same time, the opening of a dialogue with other religious cultures of the Old World." Renzo Guolo, an expert in Islam at the University of Trieste, specified why John Paul viewed ecumenism as essential. "For Karol Wojtyla, religious dialogue is necessary in order to foster the common good of humanity," Guolo wrote. "This dialogue is sustained by the awareness that there are common values across cultures, because these values are rooted in human nature. These include the defense of the family, opposition to abortion, and peace." With European Communism in retreat, John Paul turned to Islam to help him form his geopolitical vision. "Islam thus becomes the most important moral interlocutor because the Church sees it as a well-structured religion which is on the increase in contemporary Europe," Pace wrote. "The real object of this consideration of Islam is the social and cultural integration of Muslim groups in the new Europe. "To ensure this integration, the Catholic Church believes it is necessary to accept the idea of recognizing Islam as a universal religion, while, at the same time, inviting Islam to accept at least the basic moral and juridical principles of the European Christian culture (the rights of man)." In the process, Catholicism's Churchill against Communism became Catholicism's Neville Chamberlain regarding Islam. Though he regularly condemned the West's "culture of death" that embraces abortion and contraception, John Paul sacrificed suffering Christians on his geopolitical altar. Bishops remembered how the late pope, "who ordinarily speaks about all topics," Guozo wrote, "had spread a veil of silence over the persecution of Christians in Muslim countries." Pope Francis, the logical extension and consequence of decades of political primacy, provides the ultimate example of the hierarchy's infatuation with politics. In the midst of Catholicism's greatest moral crisis since the Reformation -- and in the midst of his own silence about Vigano's charges -- Francis called plastic refuse in oceans an "emergency." "We cannot allow our seas and oceans to be littered by endless fields of floating plastic," the Pope told 100 business leaders Sept. 1 at the Vatican. Francis, let alone Parolin and Cupich, must ask themselves this question: What does it profit a church to gain the whole world yet lose its own soul?